; Set hl to the address of the current metatile data ([TilesetBlocksAddress] + (a) tiles). 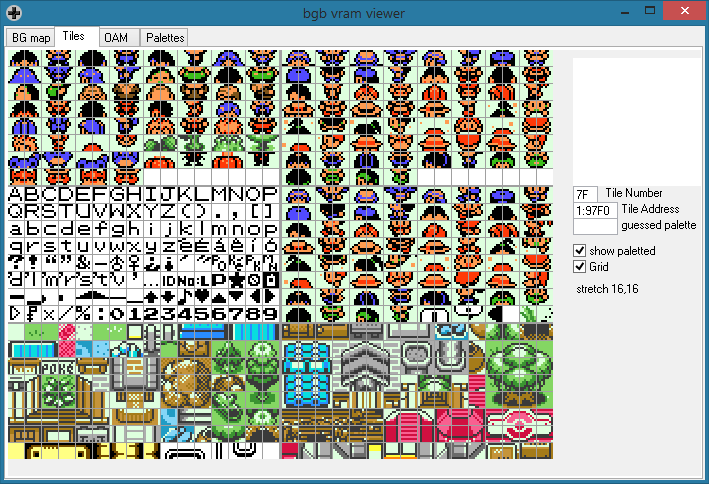 The bottom 256 tiles are for the tileset. The left ones have IDs $00 to $7F, and the the right ones $80 to $FF. 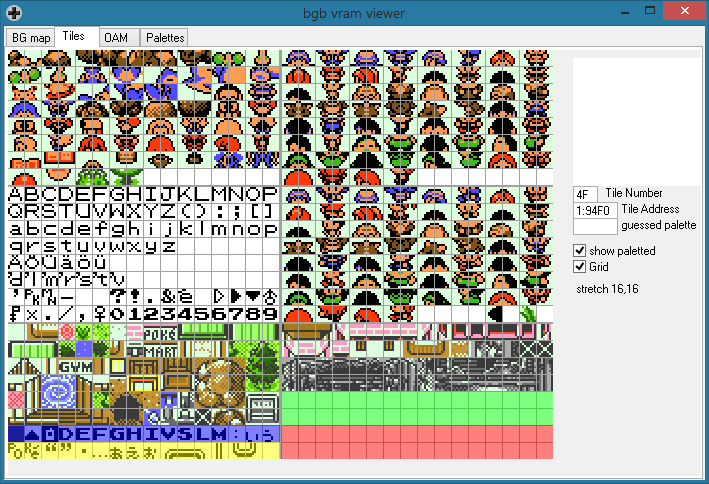 The green area, $C0 to $DF, can be used already just by extending the tileset graphics (gfx/tilesets/##.2bpp.lz) and palette map (tilesets/##_palette_map.asm). The red area, $E0 to $FF, is unused. The blue area, $60 to $6F, has only a few tiles that you need, all of which can be moved to the unused font tiles. The yellow area, $70 to $7F, is needed for the text box frame and the pop-up location name sign. I'll explain how to free up the blue and red areas, allowing 48 more tiles for a total of 240. Now the tileset graphics will get loaded into the blue and red areas too. Save that as convert.py and run "python convert.py" in the Cygwin terminal. This will let NPCs or the player stand on top of tiles $00–$6F and $80–$EF. Important! Tiles $F0–$FF cannot be stood on. If you do, and then open a text box or menu, the sprite standing on those tiles will disappear. 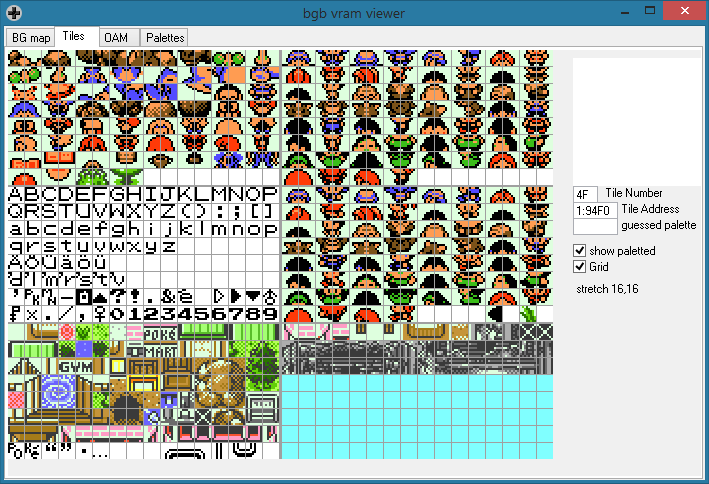 This is necessary for tiles $70–$7F, since those are text box frames: you want the text box to appear "above" the sprites, so they get hidden while the text box is open. But for tiles $F0–$FF, it means you need to use them for obstacles like trees or buildings that will never have sprites on them. Now you're no longer loading font graphics into tiles $60–$6F. Add the five highlighted characters. They're no longer being loaded from FontExtra, OverworldPhoneIconGFX, and FontsExtra2_UpArrowGFX, so now they're in the standard font. Step 8: Update code that uses the changed font characters. ld a, $69 ; "V"
ld [hl], $6a ; "S"
I believe that's all of the font changes. I may have missed some. Regardless, the core functionality works, and if you see any tile errors with font characters it should not be difficult to track down their source.